I met Andres Ruggeri at Bauen Hotel in the Cafe Utopia. 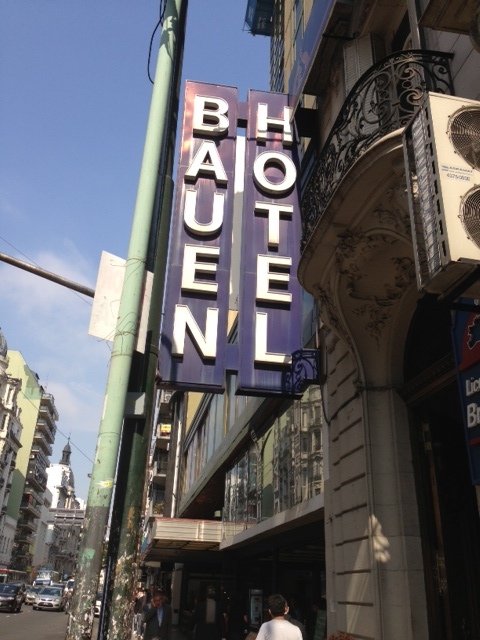 Hotel Bauen is a famous 20 story self-managed hotel, recovered by its 40+ workers ten years ago. I was excited to visit the hotel and talk to its workers before coming to Buenos Aires but it was Andres who suggested that we meet there. I was thankful for it. My heart skipped half a beat when I saw the Hotel from the corner of Corrientes and Callao. I resisted taking a photo of in the middle of the street. We’d agreed to meet at 2pm and I walked into the lobby at 1:58. Bauen has 70’/ 80’s chic elegance: mirrors, metal, marble, a piano in the center of the lobby. Its charm is ‘velvetine”, like the rabbit in the children’s story. Much of its newness and shine has been ‘loved’ away. I expected to recognize Andres because I’d watched a video of a talk he gave on the internet but as I waited, I became doubtful. I asked a couple of strangers if they were Andres. No. No. After 10 minutes, I asked the woman at reception for the wifi security code: “Hotel Bauen 360” she responded. “Tres, como?” I asked, needing her to repeat the number, afraid to mix up the Spanish numbers for 60 and 70. She rolled her eyes and snapped at me: “Tres cientos sesenta! Good thing they’re their own bosses, I thought. She must having a bad day. I sent Andres a text and then called him with no response and looked in the café again. There he was. How could I have missed him before? Without a doubt, that was him. I was nervous and embarrassed because I was now ten minutes late and felt shaky about giving my first interview in Spanish. ‘Yes, but it’s worse than your Spanish” he said. So, we had the interview in Spanish, recorded for future reference and (someday) transcription. A piece of me was excited to have a conversation in Spanish. I’ve spoken so much English with my friends since I’ve been here. Andres Ruggeri is a professor and the director of la Facultad Abierta of the University of Buenos Aires. When Andres and the co-founders of La Facultad Abierta began their work, they had no intention of working with recovered factories. Their focus was political. They planned to link to popular political movements. But when they began in 2002, the economic crisis was in full swing and the movement of recovered businesses was new and extremely important. From that beginning, as he states in the beginning of 10 Anos del Programa Facultad Abierta, la Universidad, los Trabajadores y la Autogestion , (Ten Years of the Open Faculty Program: University, Workers and Self Managment), they aimed to accompany, study, document and collaborate with the workers of the recovered factories. Prior to that time, Ruggeri himself didn’t really think about the co-operative movement. His interest came from the experience of fighting along side the workers during the early years and it continues because the movement is still relevant and growing. He believes it’s important. During the interview he said, it’s not that these 250 businesses themselves are going to change the economy overnight but they are setting an example for workers everywhere. We can learn from their experience, what does and doesn’t work, some things that are particular to Argentina and somethings that can be replicated. The world outside Argentina can take lessons the movement here.